SeeClickFix Partners with St. Paul! Today, SeeClickFix is thrilled to announce our newest city partner: St. Paul, Minnesota! As the latest state capital to join SeeClickFix, St. Paul brings in just over 260,000 citizens reporting issues in the area. "Technological excellence is no longer a choice. It is a necessity. In this digital age, we must meet residents where they are – and they’re on their smart phones. We can use this fact to make our city more responsive to our residents. Today, the city launched ‘Saint Paul Connect,’ our own mobile app available on Android and iPhone. Have a question about traffic lights? Encounter a pothole? It’s all right there. You can find more information on Saint Paul Connect by going to our home page, www.stpaul.gov, and clicking on the “Mobile Saint Paul” button. The link will take you to a dedicated webpage where we are featuring recommended apps that no resident, visitor, or business person in Saint Paul should be without. Whether it’s looking for events going on in the Capital City, or connecting to your neighborhood library, or wanting to report a pothole that needs repair, we believe these apps will enhance everyone’s experience in Saint Paul." We're excited to add them as our newest partner, as well as help St. Paul and its citizens improve. Read more on our tools for governments, or watch the entire State of the City speech. Download the Saint Paul Connect app for iPhone here, or Android here! Package Theft? No Problem for SeeClickFix Citizens. Sometimes on SeeClickFix, citizens come together and find creative solutions to community problems. Last week, residents in the neighborhood of East Rock in New Haven took to SeeClickFix to discuss a rash of package theft in the area. Seems that when packages were being delivered to people's homes and subsequently left on the porch, thieves were snatching them up before they could get home from work. These citizens banded together and not only proposed some awesome solutions--including putting out decoy boxes to deter thieves--but also got some great news coverage on WFSB and NBC Connecticut highlighting their coolness. What other cool ways have you seen your neighborhood solving problems themselves? As noted in this awesome write-up on WPCentral SeeClickFix is all riled up today thanks to the excited announcement of a new way to monitor & report issues: SeeClickFix's very first app for Windows Phone 8. A whole new world for us, this app now lets any SeeClickFixers report and track issues on-the-go from Windows Phone 8 devices. Instead of mincing words, just download the app here, and please let us know what you think by reviewing it in the marketplace! Anything from bug reports to shameless praise--we'd love to hear from you. Leave your feedback in the market, in the comments below, or give us an email. For anyone who doesn't know, TED-Ed is a relatively recent new endeavor from the folks behind the infamous TED talks. Branching off from the ethos of "Ideas Worth Sharing," TED-Ed features educators, thought-leaders, futurists, and others take under a slightly different motif: "Lessons Worth Sharing." With his talk Four principles for the open world, venerable speaker and bestselling author Don Tapscott discusses how a generation born into a technological world are and will make the environments in which they live more transparent, agile, and better for everyone. Check out the talk below, complete with a flattering mention of yours truly. Its only Tuesday today, but we've already received two very awesome mentions in the press this week. One from an article by Eric Liu, the other by John Kamensky appear on TIME Ideas and Governing Magazine respectively. Here's what they had to say. They are powering ventures like Airbnb, Car2Go, and the emerging "sharing economy." They are quick to use tools like SeeClickFix to alert both city government and their neighbors to a pothole--and they don't care who fills it first. Another type of co-production initiative involves engaging citizens--as individuals or groups---in designing or delivering a service. In youth courts, for example, first-time, non-violent offenders serve as juries that try other offenders, with the goal of reducing recidivism. Another example is the mobile smartphone app, SeeClickFix, which allows citizens in participating cities and counties to report non-emergency issues (graffiti, broken street lights, potholes) and then track the local government's response. We really appreciate the love, and if anyone ever wants to start a conversation about how SeeClickFix views civics & technology, please get in touch with us. SeeClickFix is hiring for an Account Executive to work with our rapidly increasing client base. Join a team of smart, hardworking and creative neighborhood lovers as we help citizens and their governments make their communities better together. What started as a grassroots citizen movement has become the most widely distributed and most used platform in the world for civic communication. 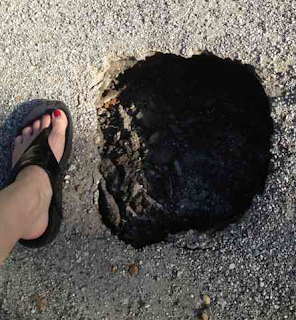 Want to get a pothole fixed in Argentina or find a lost pet in San Francisco? The SeeClickFix platform and its community is making that happen every day. As an Account Executive at SeeClickFix you will be building lasting relationships with some of our most valuable users, our city partners. From small towns like Stonington, CT to large cities like Houston, Texas you will be working directly with our clients to help them adopt new features on the SeeClickFix platform as well as help them and their citizens maximize their use of the existing tools. SeeClickFix has demonstrated the value in greater citizen involvement in governance as well as flat open communication. In this role you will help our biggest evangelists capitalize on all that the Internet can do for our communities. Check out our website or smartphone apps for examples of what we do best and also http://www.seeclickfix.com/government to learn a bit about our software for our clients. This position is for full-time employment, on-site at our office in downtown New Haven, CT. You will join a team that has grown to 16 full-time employees in the past three years. We are looking for a personality that is upbeat on the output and calm and receptive on the input. We want our partners to be excited to answer the phone from you and we want you to be excited to answer phone calls from our partners. The right person for the job will have some experience in sales or marketing but its not a must. You will need to be able to speak to the value of the SeeClickFix software with intellect and understand the benefits to both the government and the constituents they serve. While you don't have to have worked at a start-up previously you need to be prepared to work at a start-up. You must be prepared to carry weight for others and take on tasks outside of your typical responsibilities when needed. You need to be self motivated, independent and able to work your hardest in an environment where there is no boss looking over your shoulder telling you to work your hardest. Please contact Ben@SeeClickFix with your resume a few sentences on why you'd like to work here. This week is Tree Week across the pond, but the spirit of promoting the planting, spreading, and maintaining of healthy trees is alive and well here in New Haven. The City of New Haven and the Urban Resources Institute (URI) have teamed up to provide free tree planting for residents. Want some shade this summer? Request a free tree to be planted in front of your home! The tree will be professionally planted for FREE by the Urban Resources Initiative's GreenSkills planting crews! The only thing you have to do is water the tree once a week while it has leaves (May-October). If you're interested or have questions, please call us at 203-432-6189, email us at uri@yale.edu, or visit our website: http://environment.yale.edu/uri/get-involved/plant-your-own-tree/. We will begin inspecting planting sites for our spring planting season as soon as the snow melts. Request a tree as soon as possible to get on the list! The top trend on Google search right now is "sinkhole". As many have seen a sinkhole in Florida swallowed a man in his bedroom making the somewhat mundane term a buzzword around the world. I just did a data dive on SeeClickFix to see where sinkholes have been popping up recently. Here's what I came up with. You can zoom in on a location to get more reports if they exist. Feel free to add to the data set by using the report button below. Also feel free to copy this widget I created with the embed button below. Today, SeeClickFix is excited to announce our newest city partner: Champaign, Illinois. Joining the ranks of cities using new and efficient ways to find, assess, and resolve issues, Champaign's Public Works Department is already doing a great job proactively responding to and solving issues through SeeClickFix. Dennis Schmidt, the Director of Public Works for Champaign, hit the nail on the head and said, "We're excited to offer our residents another option for communicating concerns to Public Works. This will allow them to be our 'eyes and ears' so that we can be aware of and more quickly address issues."